Today, on the Fagor Industrial blog, we take a look at the new commercial refrigeration NEO Generation. This new generation offers in its top range an insulation of 80 mm, one of the biggest that can be found on the market for this kind of appliances, and includes standard LED lighting in all the ranges to reduce energy consumption. Other incorporated improvements are: the use of R-290 ecological refrigerant, with zero impact on the ozone layer and an insignificant GWP (global warming potential) that is 98% less than normal refrigerants. The compressor used is also quieter and allows lowering acoustic contamination. 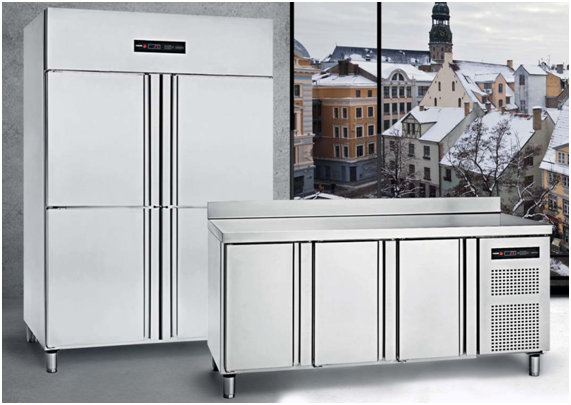 “With the launch of the new NEO Generation we are proving once again that it is always possible to go one step further in quality, performance, looking after the environment and technological innovation”, declares Iñaki Soria, Product Manager of Fagor Industrial.“Fagor Industrial’s refrigerated ranges have always marked the difference, and their capacity and versatility have made them the favourites of the catering industry’s professionals. This Generation we are presenting today is the outcome of the efforts of our R&D department in designing cabinets and tables that are an efficient tool for the day to day of any professional kitchen, whatever its needs”, concludes Soria. All these new functions have materialised in a complete and large generation of commercial refrigeration made up of three new ranges of cabinets and tables, to which the two ranges of chill blasters are added along with the rest of the complementary catalogue of commercial refrigeration products, made up of vertical display cases, cabinets for wine, wall display cases, central and wall display cabinets, cold display cabinets for snacks and sushi, ice makers and coffee tables. 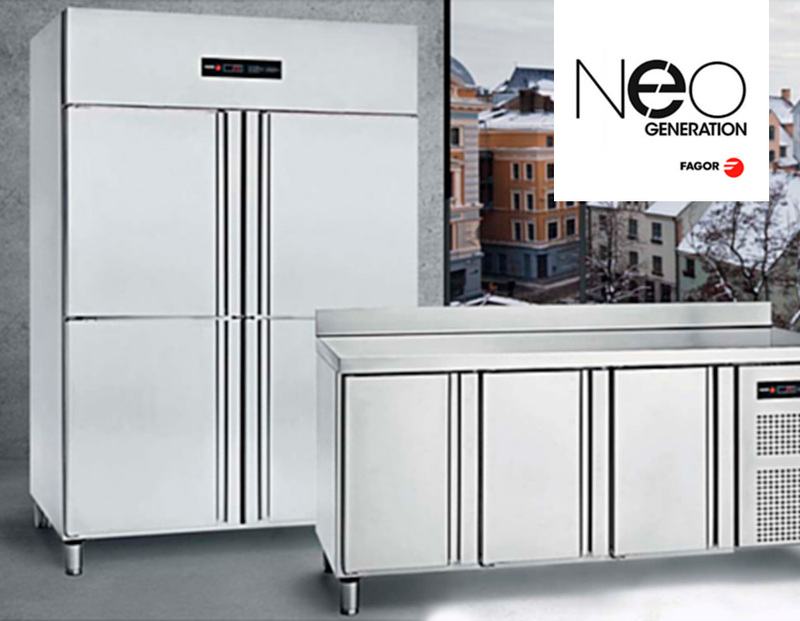 The new NEO refrigerated cabinets of Fagor Industrial are designed to meet all the needs of professionals in the industry with the simplicity, versatility and flexibility as standard. This new generation comes in three ranges: Advance, Concept+ and Concept. The Advance range materialises Fagor Industrial’s commitment to innovation, always looking to offer the most up-to-date product that answers technology, efficiency and comfort expectations. The new Advance cabinets of Fagor Industrial are marketed in the Gastronorm series, they have a recessed inside in stainless steel, sound and visual alarms linked to 3 probes and standard LED lighting. On its part, the Concept + range of Fagor Industrial uses innovative elements that considerably improve the use of the cabinets and make their daily use easier, while not reaching the high technology of the Advance range. Finally, the Concept range is marketed in the Gastronorm and Snack series, and uses elements from the top ranges to present are more consistent and perfected offer in all of the product lines. The aim is to introduce design and reliability improvements to offer a wide and economical range. The NEO refrigerated tables of Fagor Industrial are marketed in two ranges: Advance and Concept. With the same spirit and philosophy of its alter ego in the cabinet range, the Advance tables have benefited from the commitment to innovation and reliability of Fagor Industrial and have electronic and digital control of temperature and defrosting, reversible doors with automatic closing and fixing device, and sound and visual alarms linked to 3 probes located in strategic points. The best technologies have been applied to create this range combined with a design focused on improving daily working conditions. On its part, the Concept range of Fagor Industrial is marketed in three series: Snack, Patisserie and Gastronorm, with three different dimensions. This range has a refined control that offers improvements in both performance and reliability and in aesthetics. To develop this range we have combined high technology functions with an easy to handle and efficient product to become a present and future benchmark in industrial refrigeration. This range has an airtight compressor with a ventilated condenser, copper tube evaporator and aluminium wings, and electronic and digital control of temperature and defrosting. The main advantage of the new commercial refrigeration NEO Generation is the reduction in the environmental impact. In the new ranges, Fagor Industrial has developed pioneering systems with ecological refrigerants that reduce the energy consumption of the appliances to the utmost. Furthermore, the motor of the equipment uses highly reliable components, with high performance and low maintenance compressors. Another of the main features of this generation is the simplicity. To improve ease-of-use, in the new range all of the insides have been cleared of screws or right angles, the same design of control panel is offered in all the ranges and big improvements have been incorporated such as the recessed interior. The easy access to the cooling unit is particularly acknowledged by those who take care of repairs and maintenance. To improve hygiene, stainless steel has been used, embedded materials and all of the angles have been rounded. Furthermore, all the cabinets and tables, in all the ranges, have a drain that allows evacuating waste water that might build up inside the unit. Finally, all of the design of the appliances has been carried out considering making their use as comfortable as possible. The doors have an opening fixing system and self-closing up to 110º and the handles are ergonomic, covering the entire height of the door.